This is part of a series we are doing about real people who are working to fight hunger and poverty around the world. Biographic Snapshot: Jessica McClard is a 42-yr-old native Arkansan and resident of Fayetteville, AR. 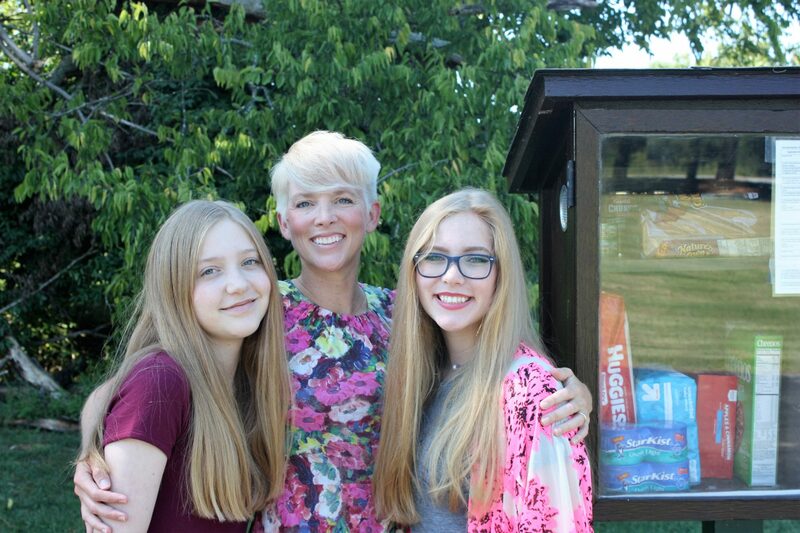 She is married to Josh and has two daughters, Grier—16, and Charly—13. Jessica has been a pottery painter, a teacher, a server, a nurse, and is currently a financial associate, but her vocation is the Little Free Pantry. WHES: A lot of people are likely familiar with “Little Free Libraries” where books are offered to borrow in a small house-shaped structure on a pole near playgrounds, schools, and in residential neighborhoods. The “Little Free Pantry” is similar only it contains food. How did the idea of the Little Free Pantry come to you and what does it do? Jessica: I am a runner and a reader. I’d often swing by a neighbor’s Little Free Library (LFL) on runs and browse its shelves. Then, another neighbor had an LFL. Then another! I do some of my best thinking on my runs. More and more, I thought about the LFL as concept. I have lots of books and imagined my middle class neighbors did too, so the LFLs in my neighborhood weren’t about access. I finally decided the LFL speaks to people because it creates space for neighborliness. The fact it addressed a larger social issue, literacy, was secondary. That meant other things might go inside and work. Books feed the mind and soul. Food feeds the mind and body. I became determined to see if the LFL concept might address food insecurity. 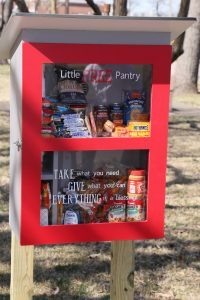 The Little Free Pantry (LFP) is a small, weatherproof space into which anyone may place food or personal care items available to anyone anytime. The LFP creates space to promote giving by neighbors to neighbors, feeding people in the process. WHES: Little Free Pantries, sometimes called “Blessing Boxes”, have been popping up around the United States, how big has this gotten? Are they in any other countries? Jessica: The LFP Project exists in lots of iterations—Blessing Boxes, Red Door Pantries, Community Food Boxes, and many others—in most states and as far away as New Zealand! Just this morning, I watched a news segment in Dutch about a gentleman in Purmerend, Netherlands, and his SoGoed Shop. That shop will soon have five siblings! WHES: How do you build your own Little Free Pantry and what should people keep in mind when setting one up? Are there resources you can share? Jessica: The Little Free Pantry Project is open source. As with naming, those interested in stewarding a project may utilize any space they want. Pilot plans are available at littlefreepantry.org, but I encourage folks to consult, utilize, adapt, or disregard! 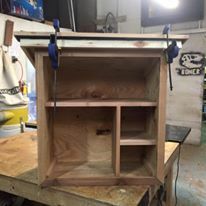 Some of my favorite projects are Craigslist upcycles and out-of-commission newspaper boxes. Site selection is the project’s most challenging component. I recommend doing due diligence to determine whether permitting will be required and obtaining host permission before construction. Generally, good hosts are privately-owned, publicly-operated entities. The website has an FAQ with additional startup information and a way to contact me should the FAQ prompt other questions/concerns. I also recommend reaching out to stewards currently operating projects in one’s area. They’ll know more about local conditions, and connection is what the project is all about. WHES: What is your best piece of advice for students and young people who want to fight hunger in their own communities? Jessica: I have two best pieces! The first is leverage social media to amplify your efforts. The second is don’t be afraid of failure. Doing is what’s important. WHES: What are you working on right now? Jessica: This time, inspired by DonorsChoose, I have an online giving marketplace called PantryGift in development. PantryGift will assemble participating LFP and LFP-like project campaigns in one place where donors anywhere may support projects anywhere. PantryGift will help the helpers feed more people. Jessica: The obvious beneficiaries of the project’s work are those experiencing food insecurity. The LFP is about feeding people, yes. But it’s also about working together and about choosing reciprocity, trust, and grace over scarcity, mistrust, and judgment. Less obvious but no less profound is the project’s effect on stewards and communities. It changes them.